Wall Street seems to regularly count out the department store's chances of recovery, but keeps getting surprised. There could be sunny days ahead for J.C. Penney despite the perennially dour outlook of Wall Street. Image source: Mike Mozart, Flickr. After regularly surprising analysts with better-than-expected performance after its near collapse in 2012, J.C. Penney (NYSE:JCP) turned in a lackluster effort to close out 2014, leaving Wall Street to doubt once more whether its turnaround efforts would ever take root. Yet after the retailer posted more robust numbers in the first quarter, narrowing its losses year over year and recording 2% higher sales (albeit coming just under analyst predictions), J.C. Penney stock is again moving higher, more than 40% above where it was trading in December. Here are three good reasons why the department store operator's stock could go higher still. Bringing back a promotional atmosphere to the shopping experience has been one way J.C. Penney lured back customers who fled the retailer after former CEO Ron Johnson instituted an everyday low price strategy. It seems he was wrong about customers being logical and seeing through the retail practice of raising prices just to lower them later. Of course, retailers have to be careful about how they approach this duplicity. J.C. Penney is being sued for what Johnson called "fake prices," because the plaintiff claims the retailer never actually sold the items at the inflated value. But overall shoppers have responded to the sales pitch, and same-store sales in the first quarter were up 3.4% from a year ago. Considering Kohl's (NYSE:KSS) comps were just 1.4% higher in the same period and Macy's (NYSE:M) actually posted a decline, J.C. Penney appears to be stealing customers back from its rivals. The momentum should break toward profitability with assistance from a campaign that gives consumers the private-label goods they clamored for along with national brands; a slimmed down, targeted catalog; and an enhanced omnichannel experience -- J.C. Penney found a buy-online/ship-to-store customer will purchase additional merchandise 20% of the time when visiting the store. Boutiques featuring beauty supplies leader Sephora have been a key ingredient in J.C. Penney's recovery. Image source: Mike Mozart, Flickr. The real star of J.C. Penney's revival has been its center core departments, including beauty supplies leader Sephora and fine jewelry. Sephora in particular is paying dividends beyond just an uptick in makeup sales; the retailer says the store-in-store boutique creates an emotional connection with customers, resulting in more traffic with high rates of conversion and higher average prices. 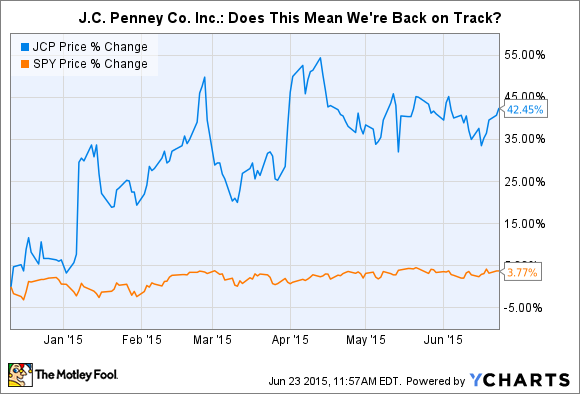 These are also higher-margin items, so J.C. Penney will continue to improve its bottom line. It's also going to expand the contributions the center core makes by beefing up the stock of handbags, fashion accessories, sunglasses, and fashion jewelry, all of which are already exceeding expectations. Women's shoes are another opportunity as only 26% of its customers purchase footwear from the retailer. As these initiatives grow, look for sales and profits to get a boost. No, not delisting from the stock exchanges, but rather bulking up the private-label collections mentioned earlier, which also happen to be higher-margin goods, J.C. Penney was able to drive increased penetration on brands like St. John's Bay, J. Ferrar, Arizona, and Xersion. Having cleared out all the merchandise that didn't sell as it reset its inventory to focus on private-label apparel, J.C. Penney expects continued gross margin improvement, raising its guidance to a 100- to 150-basis-point gain in 2015 over last year. That's a significant improvement over the 50- to 100-basis-point improvement it previously forecast. Being a rather staid department store retailer, it's unreasonable to expect J.C. Penney to benefit from a catalyst that would cause its stock to suddenly rocket higher. But the slow, steady improvement in its financial position and the outlook for its operational performance could mean its stock will inexorably push higher.